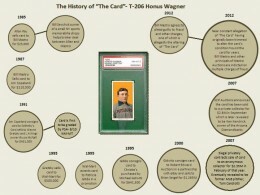 The well-documented story of The Card, a Near Mint T206 Honus Wagner, is a tale of intrigue, high-finance, corruption and fraud. Forever cemented in hobby lexicon, the chain of ownership of this cardboard treasure is documented here in an easy-to-understand timeline. One of the characteristics the PSA 8 T206 Honus Wagner has carried throughout its history is the fact that it has increased in value every time it has changed hands. This dates back to its original acquisition by the former CEO of MastroNet Auctions, Bill Mastro in 1985. For years, The Card, as it has long be referred to by collectors in the hobby, has been a headline-making machine in mainstream news outlets across America. The lore of the card's existence is one of rumor, speculation and innuendo. Some believe that the relatively rare card was pulled from production over a rights dispute with Mr. Wagner and the tobacco company that produced the card. Others prefer to believe the more altruistic tale of his scorn for tobacco. Whatever side of the story one chooses to believe, there is no denying that the T206 Honus Wagner card is what cardboard legends are made of. Much like a cherished family story, it is a tale that's passed down from one generation to the next, getting bigger every time. The tale of the PSA8 T206 Honus Wagner is a story that continues to be written. Not by hobby professionals -- graders, dealers, authenticators -- or collectors but instead lawyers and court reporters. The near pristine condition of the card may not be all that it appears. Recent events and court proceedings regarding the business dealings of Bill Mastro have created new questions regarding The Card. The answers, unfortunately, bring more questions, further contributing to the seemingly never-ending saga of this piece of hobby history. 1) Even though it happens to have a serial-number of “00000001,” it was NOT the very first card ever graded by PSA. 2) Before he went to prison in 1994, McNall sold his 50% share of The Card to Gretzky. 3) Gretzky sold The Card to Wal-Mart sometime in late ’94/early ’95 for $500,000. 4) Gidwitz bought The Card for $640,500.